Racking my brain trying to think of something to make the bears for valentine's day and this popped into my head. Giant anything is pretty cool, but something giant you can eat is the best! 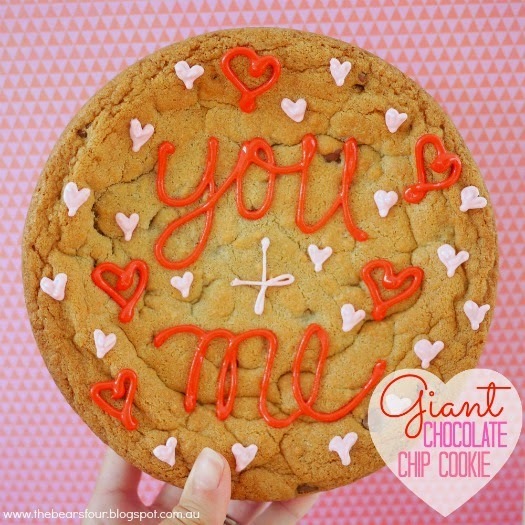 This is a great novelty valentine's day treat and it can be personalised with fun messages like "without you I'd crumble" and "your so cute I could eat you up". For the really tasty and simple recipe click below. Step 1: Preheat oven to 170 degrees Celsius fan forced. Mix flour, baking soda and salt in small bowl. In another large bowl, beat butter, granulated sugar, brown sugar and vanilla extract until creamy. Add eggs, one at a time, beating well after each addition. Gradually beat in flour mixture. Stir in chocolate chips. Step 2: Grease and flour two spring form cake pans. Spread cookie dough into the prepared pans. Bake for 20 to 25 minutes or until golden brown. Cool in pan on wire rack. Step 3: Following the instructions on the royal icing package, prepare your icing and colour it. Fill icing bag with the icing and decorate your cookies. Enjoy with a glass of ice cold milk!